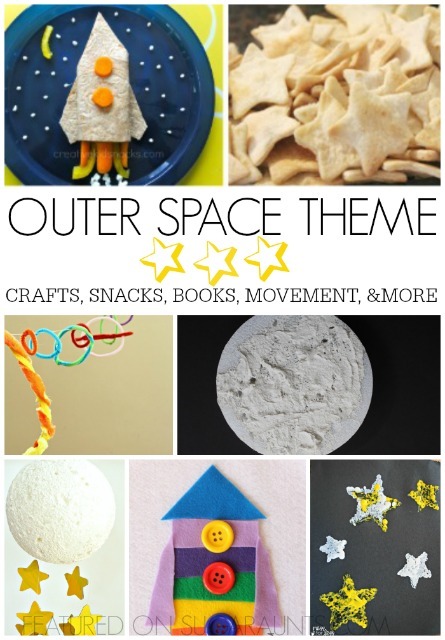 This summer, create a home summer camp with an Outer Space theme. We've been doing a ton of Space, planet, and galaxy activities recently...and sharing them, too! Our Outer Space sensory activities were a huge hit, as were our Constellation crafts. Which to do first when you've got a little space fan! You can betcha we've been pinning to our Outer Space Awesome pin board a lot! We even grabbed up a handful of our all-time favorite Outer Space books from the library to share with you. If you're looking for activities to do with the kids this summer, a space theme will be a sure hit. Your Summer Camp at home will be complete with Space crafts, Space snacks, Space sensory, fine motor, and gross motor learning and play. 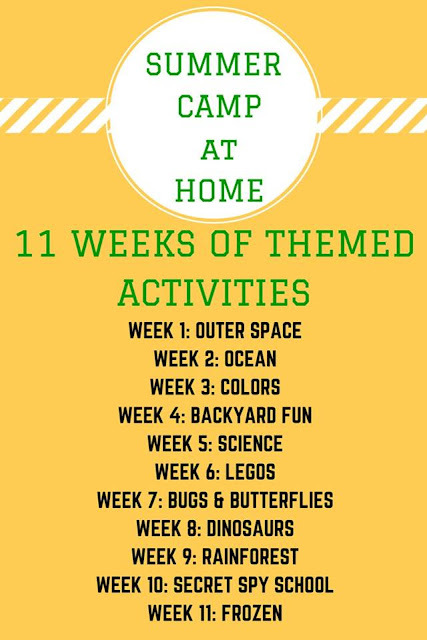 These activities are set up by theme (books, snacks, crafts, solar system models, sensory play, and movement learning activities) so that you can pick and choose activities for each day of your themed camp. Make the week work for you! Choose just one or two activities for each day, or go all out and do one from each category. It's totally up to you and your little campers! CLICK HERE TO FOLLOW OUR OUTER SPACE AWESOME PIN BOARD. Start off your daily activities during a week of Space activities with a Space book. Some of our favorites are ones we read weekly and others are ones we love to check out from the library. Stop back soon! This book list is coming to the blog tomorrow! We quickly made this space snack while doing a little space reading. Kids will gobble up the stars and planets. We even made it a fine motor sorting activity by sorting the stars and planets from the snack mix. 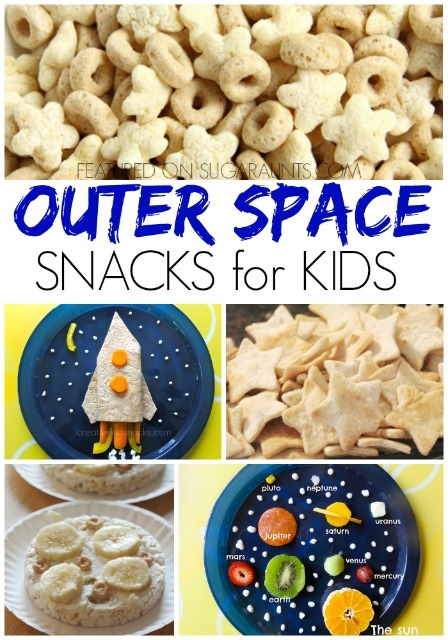 This outer space themed snack will be a hit during your Summer Camp at home or space themed week. 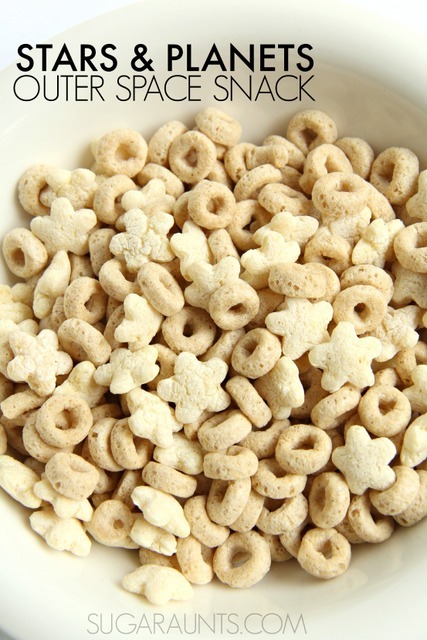 We used a cup of Cheerios Cereal and a cup of Puffs snacks to make our stars and planets snack mix. Have the kids sort the planets and stars into seperate bowls for fine motor practice that Toddlers and young Preschoolers will love. We made this Outer Space model using pipe cleaners. We didn't get into planet size, but rather checked out the size of each planet compared to the others from The Planets book and crafted them based on the pictures in the book. 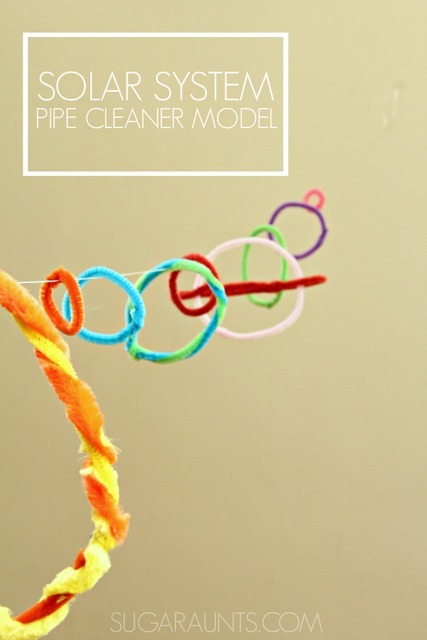 we strung the pipe cleaner planets along fishing line and taped it between two walls. This was a fun way to explore how the planets are spaced from the sun. Make a solar system with Legos like Kitchen Counter Chronicles. Kids will love this Launching Rocket Ship toy from Lalymom. Lots of ideas are to be found on our Outer Space sensory round up! I love the rocket ship in this space themed party! Climb in and out of a cardboard rocket ship for lots of movement and play. Then, use another cardboard box to make this glow in the dark space fort like Lalymom. Nurturestore made a great Space math game. Any kid would love these recycled plastic bottle jet packs! Have fun with your Outer Space themed week of fun! Be sure to follow our Outer Space Awesome pinterest board for more ideas. Also, be sure to check out our Circus themed summer camp at home activities from last year.